In order to convince your clients that you are the best representation option for them, you have to have a lawyer WordPress theme with features that will highlight your best work, services, and principles. For example, sliders and galleries are ideal for introducing your team of attorneys and paralegals. Flexible blog layouts will let you keep loyal readers up to date on legal news and guide them to you when they have legal problems you are experienced to handle. In addition, translation support, mobile-friendliness, a client testimonial section, and compatibility with map and contact form plugins are a must. And don’t forget the standard website essentials such as built-in SEO, easy site navigation, and cross-browser compatibility. If you are going to build your client base and become the best lawyer in town, you are going to need to cater to everyone regardless of where they access you. 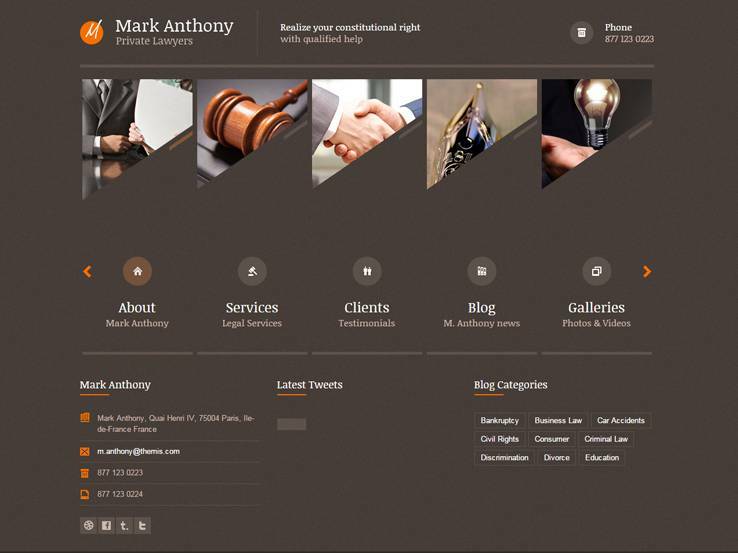 If you are in the market for an exceptional WordPress theme that will suit your legal practice needs, keep reading. 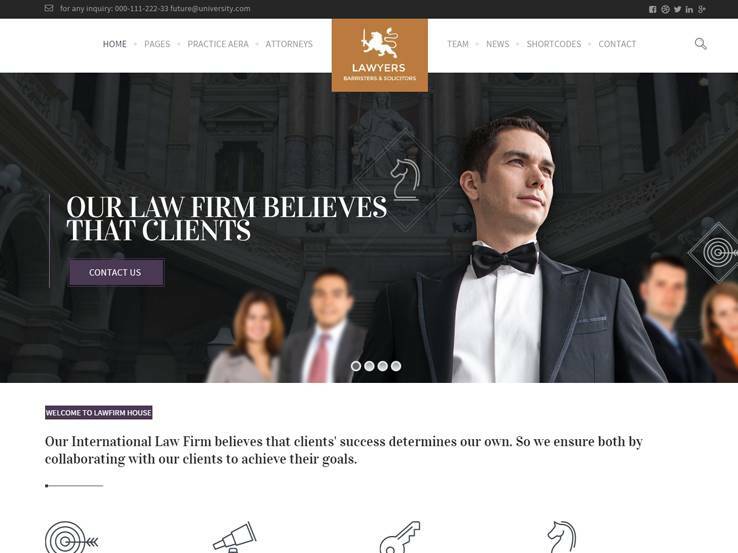 We have compiled over 20 of the very best lawyer WordPress themes that will work for lawyers, consulting firms, and any type of legal practices. Please leave us a comment below if you feel we left out one of your favorite themes. Law Office is a perfect fit for all legal and law-related services. The template features a fully responsive layout, optimized for mobile devices. WP Booking Calendar plugin allows your clients to book the appointments online. 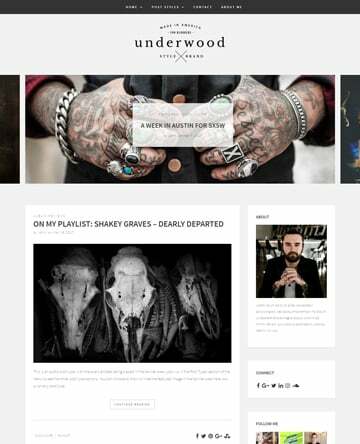 The theme is fully customizable and provides you a great variety of headers, footers, menu configurations and sliders. Parallax effect and video background add additional dynamics to your website. 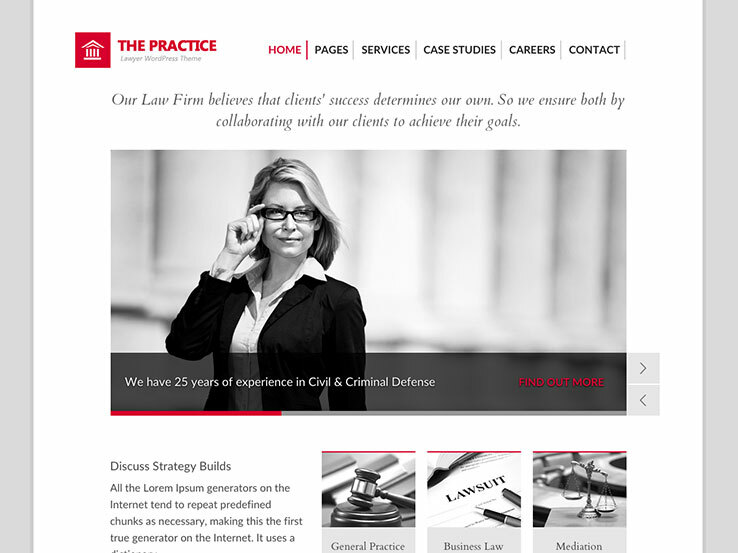 Tailored for attorneys, legal offices, or consultancy firms, The Practice is a full-featured lawyer WordPress theme designed to give you a clean and professional look that will represent your business in style. For starters, this theme has an intuitive options panel for changing everything from colors to blog layouts to typography. In addition, The Practice offers lawyers plenty of demo content. This is helpful for those looking to build their website rather than spend tons of money paying a professional developer. Moreover, for those with limited experience dealing with websites, there is a built-in feature that automates your website’s backups, so you never have to worry about losing content. The Practice also integrates Google Fonts, 3 professional looking sliders, and a drag & drop building interface for adding all of the elements needed to promote your legal services. In addition, this lawyer theme works well with the popular translation plugin WPML for reaching an international audience. Lastly, it offers a powerful contact form module enabling you to create a customized contact form so all interested clients can get in touch and retain you as their attorney. 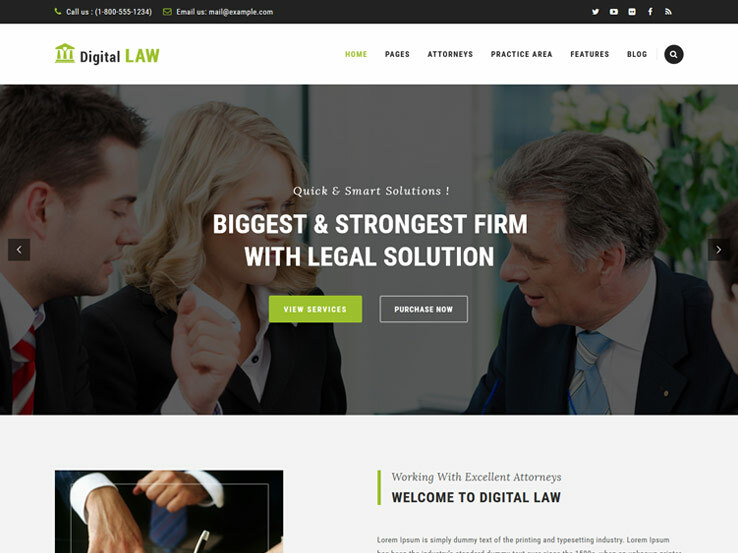 Digital Law lays claim to being the best lawyer and attorney WordPress theme on the market today. To back that assertion up, they offer website owners over a dozen powerful features. 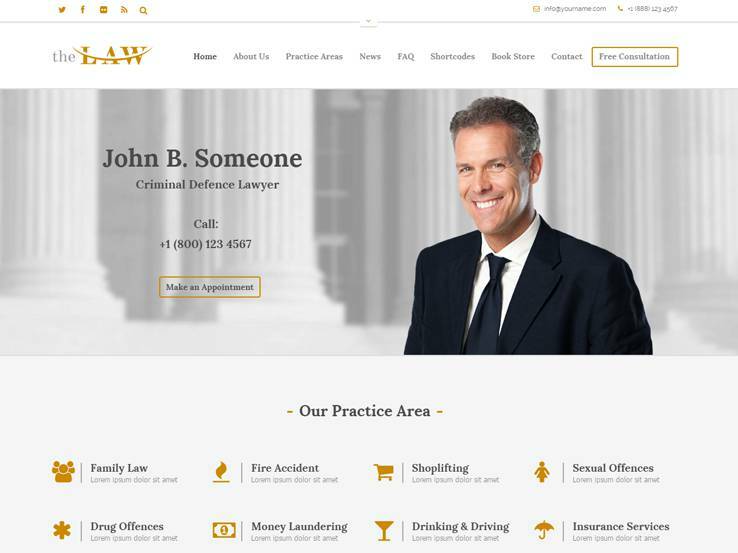 For instance, enjoy cool effects such as parallax sections and smooth animations to make your website stand out amongst the rest of the business-themed attorney websites. In addition, take advantage of the pre-packaged Visual Composer plugin for easy drag & drop page building, choose from over 250 theme options to suit your customization needs, and rest assured your team’s images will shine crystal clear thanks to the built-in retina ready design. Additionally, this attorney-based theme provides unlimited menu styles so site visitors can navigate your website easily. As a website that needs clients to understand the law, know what type of legal services they need, and feel comfortable in who they are hiring, there is nothing better than a customized menu leading them to all of the essential information. In the end, Digital Law also comes SEO friendly, WooCommerce compatible, and can even display as a simple yet effective one-page website. The Ark is a multipurpose WordPress theme that will flatter any legal firm or office with its multitude of “never-before-seen” features. Take for instance the Background Layers engine, that essentially allows your website to animate both horizontally and vertically in layers as one, to create the ultimate viewing experience. This feature paired with parallax effects, vertical centering, and full height sections will surely impress site visitors upon entering your website and encourage them to explore for more information. Also, this beast of a theme has over 300 unique demo pages along with 223+ large section blocks for easy insertion of all of your firm’s company information. 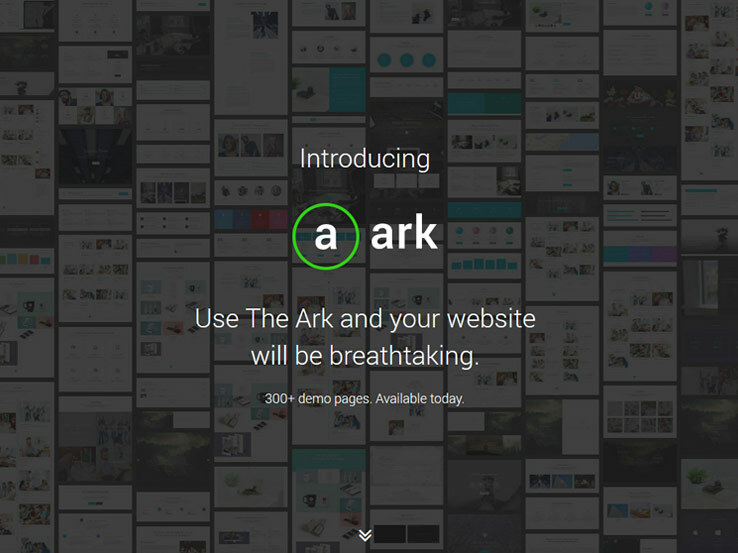 Adding the #1 page builder in the world to your theme purchase, Fresh Builder, The Ark makes developing a website on your own easier than ever. Pick from various blog layouts, include a portfolio of your best trial successes, and index your site quickly using the compatible Yoast SEO plugin. 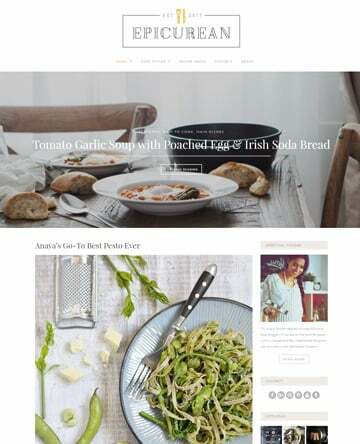 Lastly, add an email subscription box to keep readers updated, build an online services shop with WooCommerce, or even design a stunning slider featuring your team’s best headshots. This responsive WordPress lawyer theme has everything your future clients will need, plus what you need to success as an attorney as well. To start, have your pick from unlimited colors for all website elements, choose from over 650 Google Fonts, translate all of your blog content, and do it all using the elegant page builder – no coding knowledge required. Need more? Use the premium Revolution Slider for adding images of your team and their personal profiles, all at no cost. Law Practice also comes with extensive shortcodes for added functionality and has sophisticated SEO options for pages and posts. In addition, it comes with the Custom Services post type so you can reveal your firm’s proudest moments in court in a professional and eye-catching way. This lawyer theme also comes packed with resources you and your attorneys can use such as the Practice Management, CaseStudy Management, and Team Management features for keeping your team up-to-date on all things firm related. If you are in the market for a business WordPress theme catering to lawyers, judges, legal practice, and consultancy firms, Themis is a great option. 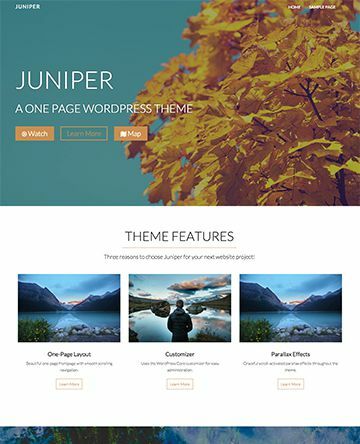 For instance, this lawyer theme comes with the exclusive Theme Demo Data Installer which is perfect for those with very little experience, or patience, when it comes to building a website. With the Theme Demo Data Installer, you can import complete sets of theme demos, including pages, posts, and even widgets, all with a single click. Moreover, Themis is loaded with over 20 different page layouts and 30+ shortcode options for improved site functionality. Themis is fully responsive meaning every site element adapts to all device sizes. Additionally, this feature packed theme offers over 800 fonts, supports RTL languages for your international clients, and includes plenty of added icons and tab icons for adding a bit of visual appeal to what is sometimes considered a drab profession. Moreso, spruce up your site’s design by including a slider complete with cool animation effects, an auto-playing home tabs section, galleries for sharing team members’ headshots, and even a built-in Lightbox for embedding images and video. The Law is a WordPress theme that truly lays down the law when it comes to providing a feature set perfectly crafted for those in the corporate legal industry. In fact, one of The Law’s most unique features is the built-in Consultation and FAQ forms. With an easy to use set up, your potential clients will be able to get in touch easily and note their exact legal issue before sending a contact request to your firm. More so, this exceptional law theme offers 7 different slider options for making a bold statement about your firm without looking like every other website on the internet today. Unlimited color options, sidebars, portfolio and photo galleries give even the most novice of lawyers a way to set up their website in an efficient, informational, and visually appealing manner. In addition, you can take advantage of the 7 helpful custom widgets such as ads, embed video, and portfolio. Plus you can integrate your own Facebook box for adding the social media element that is so important to websites these days. In the end, a built-in maintenance mode, sticky menu, smooth scrolling effect, and 100+ shortcodes lend to law firms looking to start their own website and promote their business. 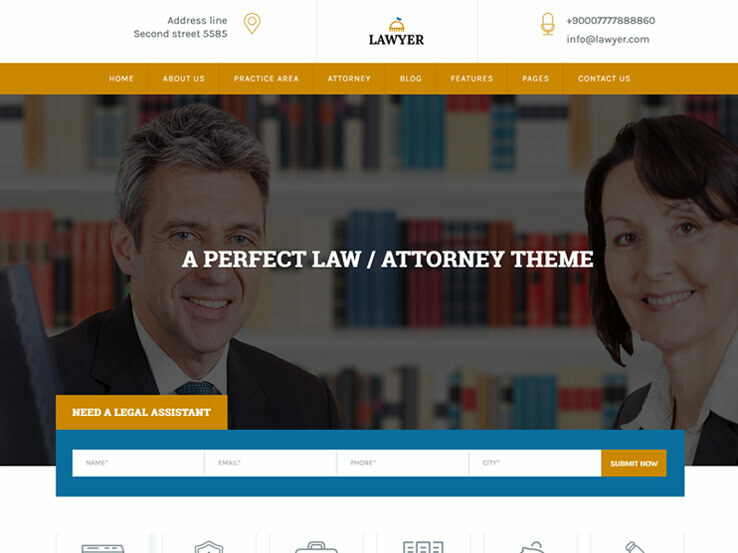 With the proper functionality needed to run a good legal website, A Lawyer is a beautifully designed professional lawyer theme with 3 homepage variations to suit your individual needs. It also includes 2 content layouts with large or small featured post images complete with snippets, so your site visitors know exactly what each article is about. And, don’t forget the 2 attorney profile layouts for highlighting your team and their significant career accomplishments. With the premium Visual Composer plugin included with your theme purchase, creating a website for your firm will be as easy as putting together building blocks of information using a drag & drop interface. 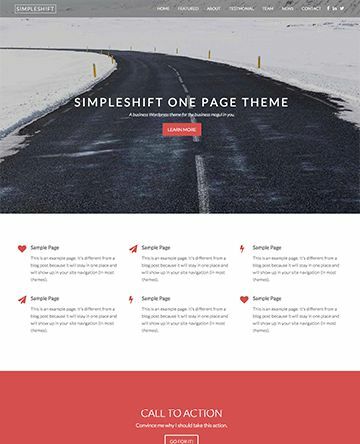 To add to that, this theme has a slider for more firm imagery, animated hover effects, SEO optimization, and plenty of available shortcodes for things like toggles, buttons, tabs, and much more. 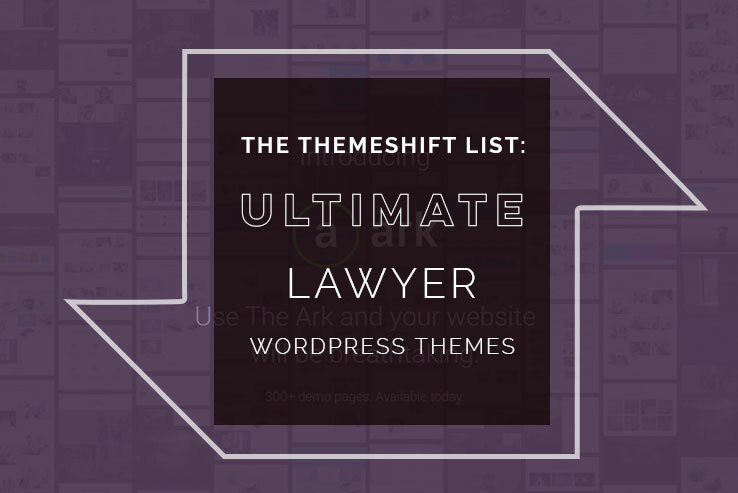 Altogether, if you need a simple to use but feature-packed lawyer theme, A Lawyer, might be just the ticket. 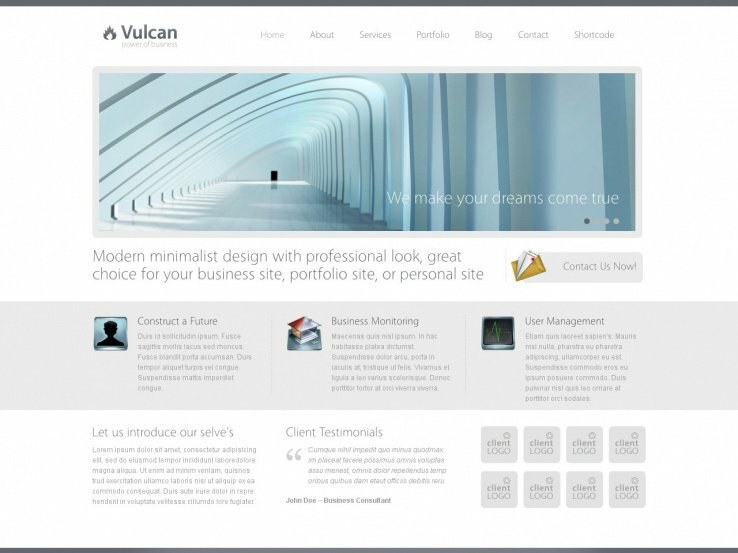 Deemed a minimal business WordPress theme, Vulcan is ideal for those looking to keep their law firm website clean and clutter free, while also relaying all of the required information to those seeking to retain you as their legal representative. Start by choosing from 5 color schemes to match your branding and company personality. Next design custom page templates, fill in any of the 8 available widget spots with any of the 8 available and super exclusive Vulcan widgets and stage each slideshow you include on your set differently for variations and eye-catching appeal. With a powerful built-in AJAX Contact Form, all interested clients will be able to get in touch with you. And, since Vulcan is cross browser compatible and mobile-friendly, you will be able to promote your brand across a large audience and remain accessible regardless of location or device. 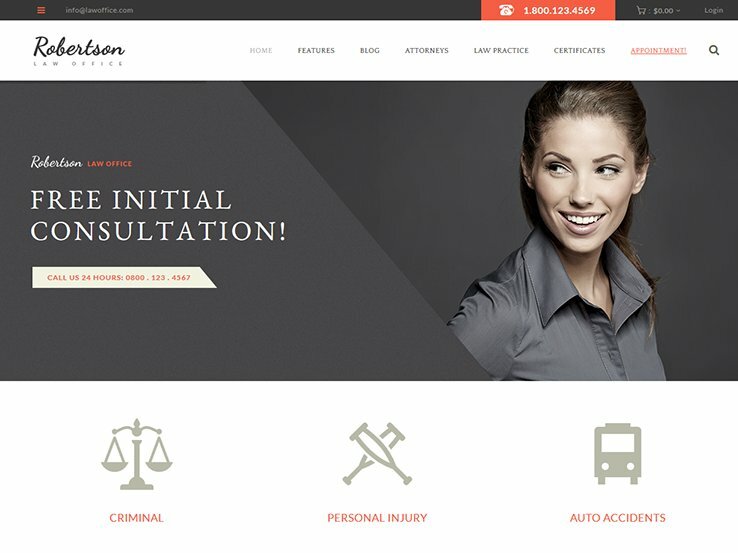 If you prefer an attorney theme that is simplistic yet effective, Vulcan does just that. What it doesn’t do is sacrifice speed, performance, or overall web design.